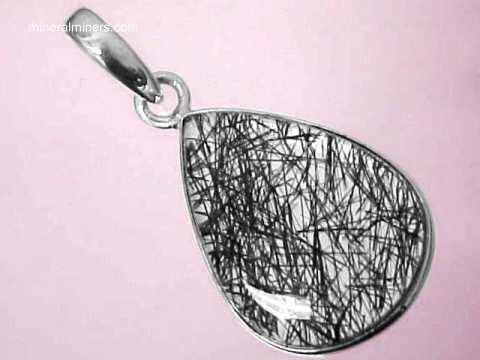 Try our Natural Black Tourmaline Crystals Satisfaction Guarantee - compare our prices and our superior quality. Click on any genuine black tourmaline mineral specimen image below to enlarge it. Black Tourmaline in Matrix Dimensions: 2.2" x 2.1" x 1.2"
This natural pegmatite mineral specimen has a matrix of semi-transparent quartz with some albite feldspar. 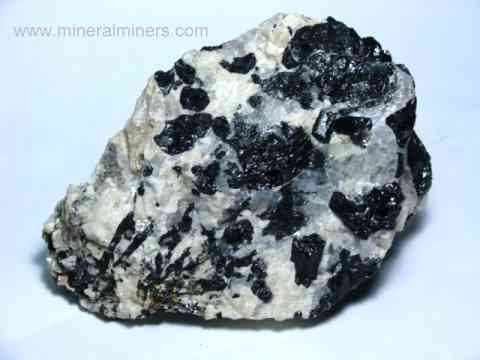 This pegmatite matrix specimen has several black tourmalines embedded in its surfaces and passing all through the matrix. Black Tourmaline Dimensions: 2.4" x 2.3" x 2.2"
This naturally terminated black tourmaline specimen was mined in Brazil. It is a black tourmaline crystal section with rough broken surfaces at each end. It has trigonal prismatic form with well-developed second-order hexagonal prismatic faces. The prismatic faces are in very good condition overall. Natural black tourmaline specimen dimensions: 4.8" x 3.2" x 3.2"
This natural pegmatite mineral specimen has a matrix of semi-transparent quartz with albite and muscovite. This pegmatite matrix specimen has several dozen black tourmalines embedded in its surfaces and passing all through the matrix! This unique black tourmaline crystal measures 2" x 1.8" x 1.8"
This naturally terminated black tourmaline crystal has trigonal prismatic form with well-developed second-order hexagonal prismatic faces. The prismatic faces and the terminations of this natural black tourmaline specimen are in very good overall condition. 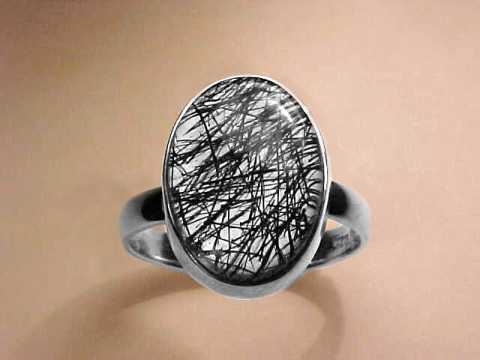 See another view of this natural black tourmaline crystal. Black Tourmalines in Matrix Specimen Dimensions: 4" x 3.1" x 2.6"
This natural mineral specimen of black tourmalines in matrix has a mica schist matrix with over two dozen black tourmaline crystals embedded in its surfaces and throughout the matrix. 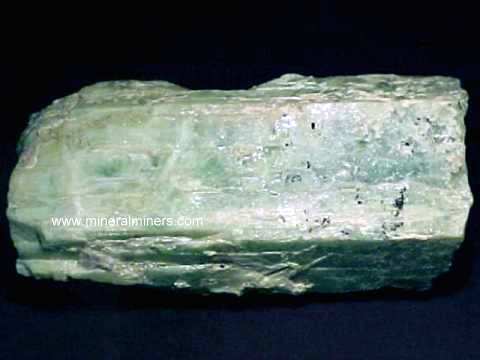 Most of the tourmalines show natural terminations. There are several more black tourmaline crystals exposed on the opposite side. See an opposite side view of this natural black tourmaline in schist mineral specimen. Black Tourmaline Dimensions: 5" long x 3" x 2.6"
This naturally terminated black tourmaline specimen was mined in Brazil. It is a black tourmaline crystal section with rough broken surfaces at each end. It has trigonal prismatic form with well-developed second-order hexagonal prismatic faces. The prismatic faces are in mostly good condition. This unique black tourmaline crystal measures 2.8" x 2.1" x 2"
This naturally terminated black tourmaline crystal has trigonal prismatic form with well-developed second-order hexagonal prismatic faces. The prismatic faces and the terminations of this natural black tourmaline specimen are in good overall condition. This unique black tourmaline crystal measures 2.8" x 2.2" x 2"
This naturally terminated black tourmaline crystal has trigonal prismatic form with well-developed second-order hexagonal prismatic faces. The prismatic faces and the terminations of this natural black tourmaline specimen are in very good overall condition. See an opposite side view of this natural black tourmaline crystal. This unique black tourmaline crystal measures 2.7" x 2.4" x 2.4"
This unique black tourmaline crystal measures 2.6" x 2.3" x 2.2"
This naturally terminated black tourmaline crystal has trigonal prismatic form with well-developed second-order hexagonal prismatic faces. The prismatic faces and the terminations of this natural black tourmaline crystal specimen are in good condition overall with some minor abrasions. This naturally terminated black tourmaline mineral specimen shows trigonal prismatic form with well-developed second-order hexagonal prismatic faces. The prismatic faces and the terminations of this natural black tourmaline specimen are in very good overall condition with some minor abrasions. See another view of this natural black tourmaline mineral specimen. Black Tourmaline Dimensions: 5.4" long x 4.2" x 3.6"
This naturally terminated black tourmaline specimen was mined in Brazil. It is a black tourmaline crystal section with rough broken surfaces at each end. 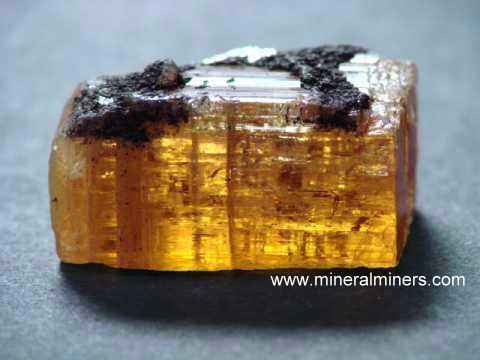 It has trigonal prismatic form with well-developed second-order hexagonal prismatic faces. The prismatic faces are in good condition overall. This natural black tourmaline crystal measures 2.9" x 2.3" x 2.3"
This unique naturally terminated black tourmaline specimen has trigonal prismatic form with well-developed second-order hexagonal prismatic faces. The prismatic faces and the terminations of this natural black tourmaline specimen are in very good condition with some minor abrasions. See another view of this natural black tourmaline crystal. This unique black tourmaline crystal measures 2.7" x 2.3" x 2.3"
This naturally terminated black tourmaline crystal has trigonal prismatic form with well-developed second-order hexagonal prismatic faces. The prismatic faces and the terminations of this natural black tourmaline specimen are in very good condition. Natural black tourmaline specimen dimensions: 4.7" x 2.9" x 1.9"
This natural pegmatite matrix specimen has a matrix composed of translucent quartz with some white albite, clay minerals, and mica. This matrix specimen has dozens of black tourmalines embedded in its surfaces and passing all through the matrix. This unique black tourmaline crystal measures 3.4" x 3.2" x 3"
This large naturally terminated black tourmaline crystal has trigonal prismatic form with well-developed second-order hexagonal prismatic faces. The prismatic faces and the terminations of this natural black tourmaline specimen are in very good condition with some minor abrasions and a small amount of schist matrix on some surfaces. See another view of this natural black tourmaline crystal. This unique black tourmaline crystal measures 3.9" x 3.3" x 2.8"
This naturally terminated black tourmaline crystal has trigonal prismatic form with well-developed second-order hexagonal prismatic faces. The prismatic faces and the terminations of this natural black tourmaline specimen are in very good condition with some minor abrasions. See another view of this natural black tourmaline crystal. 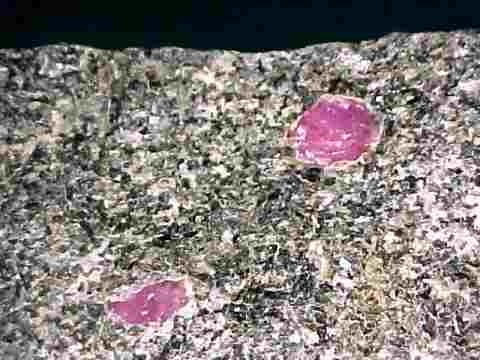 There is a small amount of mica schist still attached on one side. See also another view showing the mica schist on the side of this natural black tourmaline crystal. This large naturally terminated black tourmaline crystal has trigonal prismatic form with well-developed second-order hexagonal prismatic faces. The prismatic faces and the terminations of this natural black tourmaline specimen are in very good condition with some minor abrasions. See another view of this natural black tourmaline crystal. This unique black tourmaline crystal measures 5.3" long x 3" x 2.6"
This large naturally terminated black tourmaline crystal has trigonal prismatic form with well-developed second-order hexagonal prismatic faces. The prismatic faces and the terminations of this natural black tourmaline specimen are in very good condition with some minor abrasions. See a side view of this large black tourmaline crystal. This unique black tourmaline crystal measures 4" x 3.7" x 3.5"
This large naturally terminated black tourmaline crystal has trigonal prismatic form with well-developed second-order hexagonal prismatic faces. The prismatic faces and the terminations of this natural black tourmaline specimen are in very good condition with some minor abrasions. Natural black tourmaline specimen dimensions: 5" x 3" x 3"
This natural pegmatite mineral specimen has a matrix of translucent quartz with some white albite and mica. 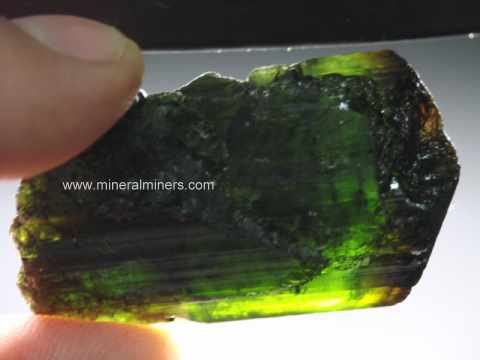 There are over 100 black tourmalines embedded in its surfaces and all through the matrix! See also an opposite side view of this natural specimen of black tourmalines in pegmatite matrix. Black tourmaline crystal dimensions: 2.75" long x 1.5" x 1.3"
This naturally terminated black tourmaline crystal specimen shows trigonal prismatic form with well-developed second-order hexagonal prismatic faces and with natural terminations on each end (known as bi-terminated or double-terminated). The terminations are in good overall condition with some minor abrasions. Natural black tourmaline specimen dimensions: 5.7" x 5.3" x 2.5"
This natural pegmatite matrix specimen has a matrix composed of translucent quartz with some white albite, clay minerals, and mica. This matrix specimen has dozens of black tourmalines embedded in its surfaces and passing all through the matrix. Some actually reach all the way through to the opposite surface where their diameters have increased by 4-5 times! 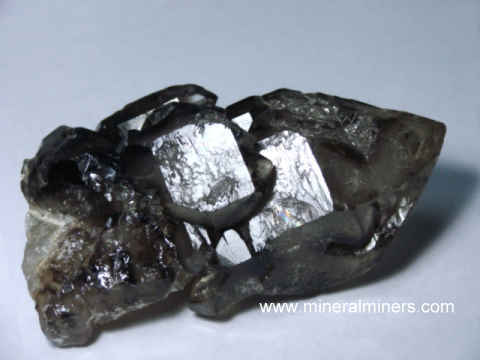 See an opposite side view of these black tourmalines in quartz. Natural black tourmaline specimen dimensions: 9" x 8" x 3.2"
This natural pegmatite matrix specimen has a matrix composed of translucent quartz with some white albite, clay minerals, and mica. This matrix specimen has hundreds of black tourmalines embedded in its surfaces and passing all through the matrix! 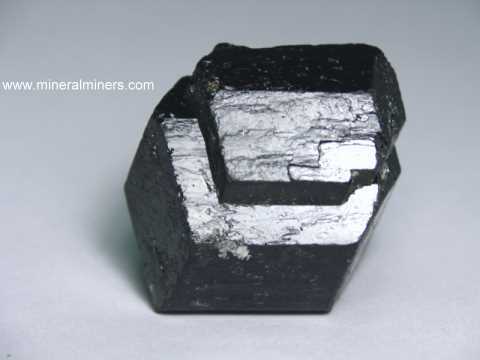 See also an opposite side view of this spectacular black tourmaline crystals in matrix. Natural black tourmaline specimen dimensions: 10.5" x 8.5" x 8"
This natural decorator mineral specimen has a matrix of translucent quartz with feldspar, clay minerals, and mica. This one-of-a-kind pegmatite matrix specimen has over a hundred black tourmalines intergrown with the matrix. Natural black tourmaline specimen dimensions: 12" x 7.5" x 6.5"
This natural decorator mineral specimen has a matrix of translucent quartz with some feldspar, clay minerals, and mica. This pegmatite matrix specimen has hundreds of black tourmalines embedded in its surfaces and passing all through the matrix. See also an opposite side view of this spectacular black tourmaline in quartz decorator specimen. Natural black tourmaline specimen dimensions: 11" x 9" x 5"
This natural decorator mineral specimen has a matrix composed of translucent quartz with some feldspar, clay minerals, and mica. This pegmatite matrix specimen has hundreds of black tourmalines embedded in its surfaces and passing all through the matrix. This beautiful decorator specimen stands up in the position shown. 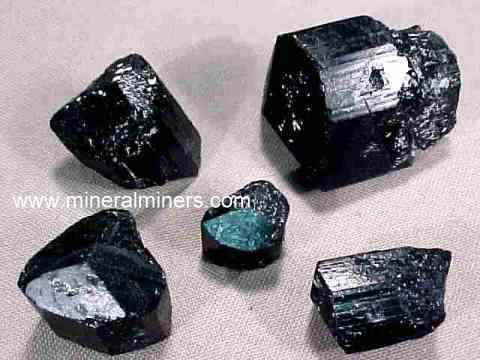 See a side view of these black tourmalines in matrix. See also an opposite side view of this natural decorator specimen of black tourmalines in matrix. Natural black tourmaline specimen dimensions: 12.5" x 9" x 8.5"
This amazing decorator mineral specimen has a matrix of translucent quartz with feldspar, clay minerals, and mica. 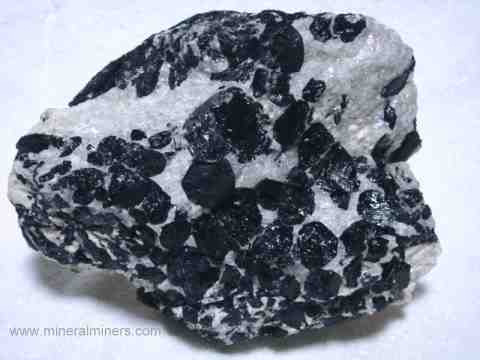 This natural pegmatite matrix specimen has hundreds of black tourmalines intergrown with the matrix. Natural black tourmaline specimen dimensions: 15" x 9" x 7.5"
This natural decorator mineral specimen has a matrix of translucent quartz with feldspar, clay minerals, and mica. This pegmatite matrix specimen has hundreds of black tourmalines intergrown with the matrix. See also a different view of this beautiful decorator specimen of black tourmalines in quartz matrix. These polished black tourmaline pieces were tumble polished from 100% natural black tourmaline crystals that were mined in Minas Gerais, Brazil. 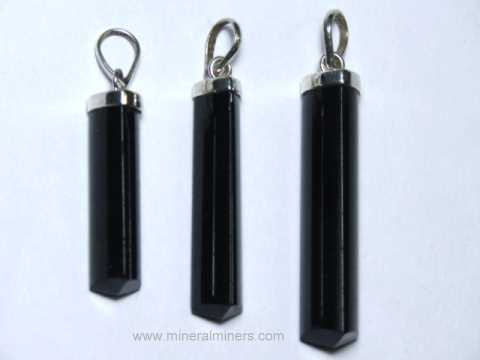 These rounded & polished pieces of black tourmaline are very popular for metaphysical purposes, and they fit comfortably in your hand, pocket, or purse. These black tourmaline polished pieces are very inexpensive, and they also are very convenient for placing around computer work stations, etc.. as protection against electro-magnetic energies. 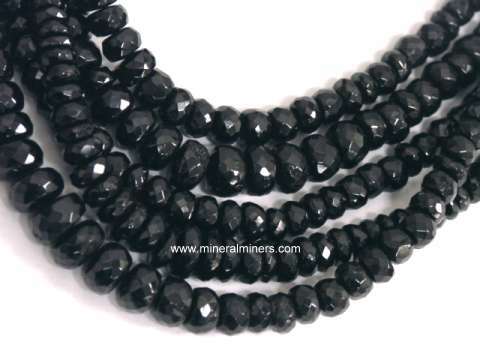 We have these large size tumbled black tourmaline pieces available at specially discounted volume prices. Please see below for prices, quantities, and ordering. These naturally terminated black tourmaline crystals have trigonal prismatic form and natural terminations on each end (known as bi-terminated or double-terminated). The terminations of these small black tourmalines are in good condition overall, with some abrasions. Their small size makes them perfect for metaphysical uses and for feng shui, and they also are very nice as mineral specimens. Each of these black tourmaline crystals has all natural prismatic faces and terminations. We have 3 sizes of these small double-terminated black tourmaline crystals available: 1 inch, 1.25 inches, and 1.5 inches (sizes are approximate). Please see below to order. These naturally terminated black tourmaline crystals were mined in Brazil. Their small size makes them perfect for metaphysical uses, and they also are very nice as natural black tourmaline mineral specimens. 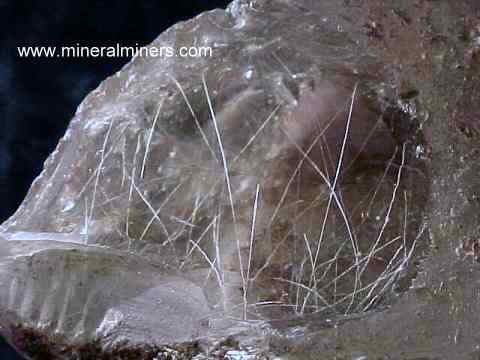 Each crystal has natural prismatic faces and some terminations. We have two sizes of these small black tourmaline crystals available at specially discounted volume prices: 1.1" diameter, and 1.5" diameter (sizes are approximate). Please see below to order. This unique black tourmaline crystal measures 1.9" x 1.4" x 1.3"
This naturally terminated black tourmaline crystal has trigonal prismatic form with well-developed second-order hexagonal prismatic faces. The prismatic faces and the terminations of this natural black tourmaline specimen are in good condition with some minor abrasions. 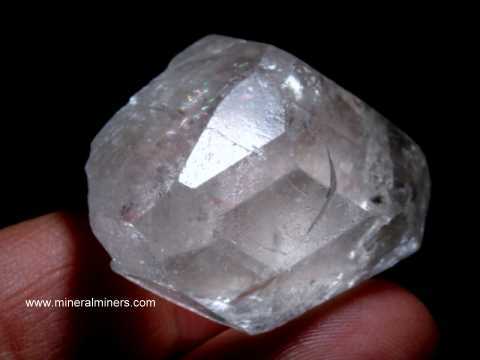 This natural pegmatite mineral specimen has a matrix of translucent quartz. This matrix specimen has many large black tourmalines embedded in its surfaces and passing all through the matrix. This unique black tourmaline crystal measures 1.7" x 1.7" x 1.6"
This naturally terminated black tourmaline crystal has trigonal prismatic form with well-developed second-order hexagonal prismatic faces. The prismatic faces and the terminations of this natural black tourmaline specimen are in very good condition with some minor abrasions. This unique black tourmaline crystal measures 2.2" tall x 1.7" x 1.4"
Our Black Tourmaline Crystals and Black Tourmaline in Matrix Mineral Specimens are all 100% natural - just as they were found inside the earth! 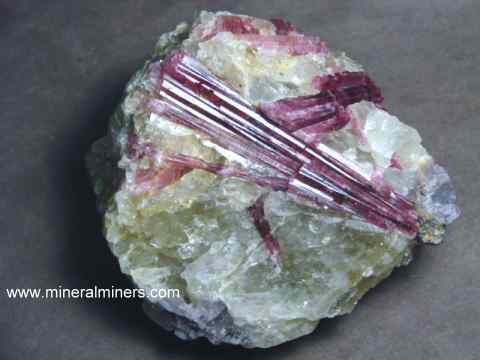 See also our page displaying natural pink tourmaline crystals, our natural green tourmaline crystals, or simply see our page displaying natural tourmaline crystals of all colors! 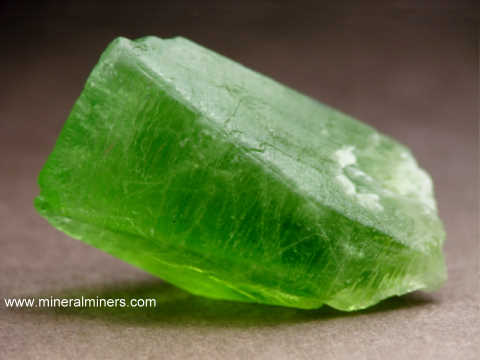 We have a large variety of green tourmaline crystals in pegmatite matrix, including some tourmalines with gem grade transparency. 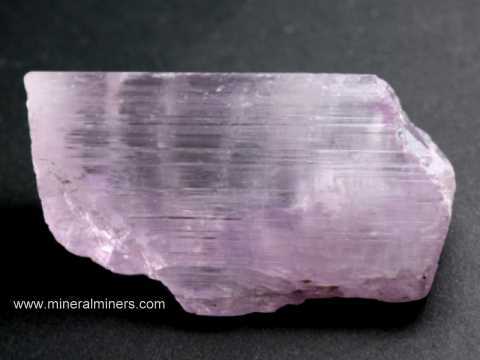 We also have a large selection of natural pink kunzite crystals and natural yellow kunzite crystals, natural aquamarine crystals, and natural blue kyanite crystals & black kyanite crystals. 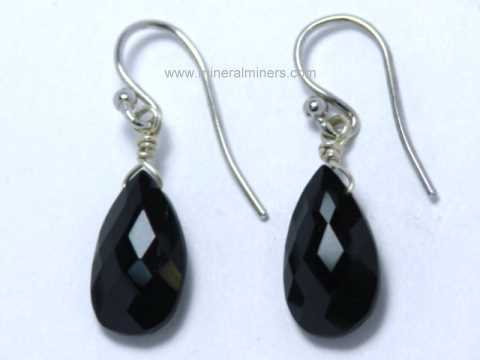 We do have a very large selection of natural black tourmaline jewelry designs, as well as our pink tourmaline gemstones and sunset tourmaline earrings. 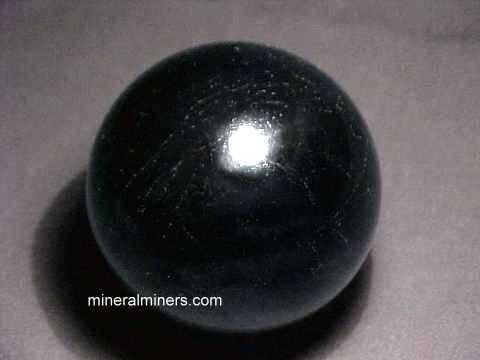 We have a variety of genuine black tourmaline products available including handcrafted jewelry items, black tourmaline spheres, and also black tourmaline mineral specimens & crystals. To see more black tourmaline photos, just select another item category from the table below. 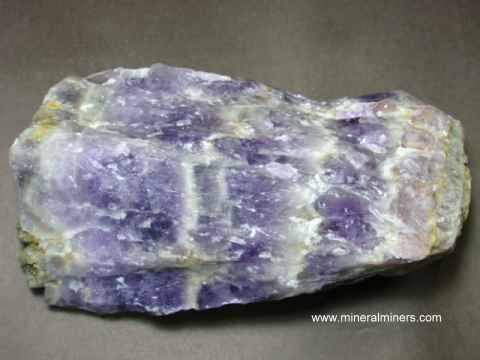 We also have pages displaying natural quartz crystals, natural blue kyanite specimens, and our natural kunzite specimens. 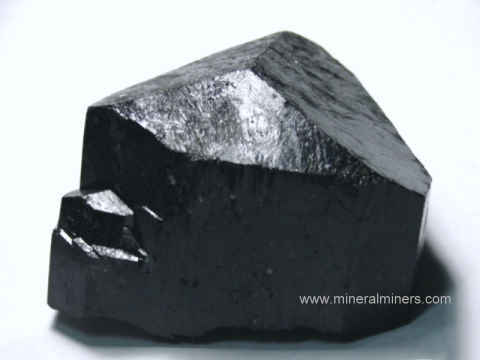 We have additional inventory of black tourmaline mineral specimens and black tourmalines in matrix. Most of our black tourmalines formed in pegmatite dikes, although we do have some specimens of naturally terminated black tourmaline crystals that crystallized under metamorphic conditions. 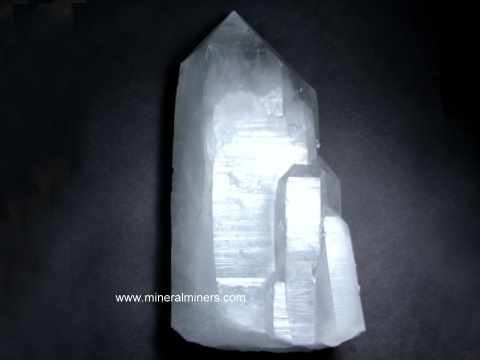 See also our natural crystal pages displaying genuine quartz crystal mineral specimens, kyanite crystal in matrix & kunzite specimens that were all mined in Brazil. 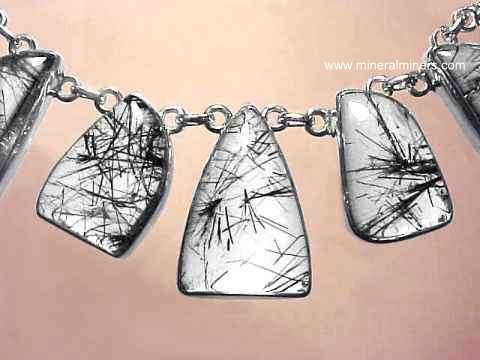 See also our handcrafted black tourmaline jewelry. 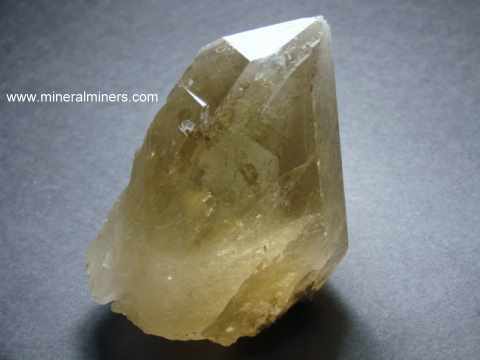 We have been mining for aquamarine, citrine, kunzite, topaz, black tourmalines, tourmaline gemstones and other gems for more than 25 years, and we have a very large variety of natural mineral specimens available in many different minerals. We have natural color tourmaline specimens available in each of the tourmaline varieties including rubellite tourmaline mineral specimens, blue tourmaline crystals, and a large selection of all natural color green tourmaline mineral specimens! We also have some amazing multi-color tourmaline specimens! 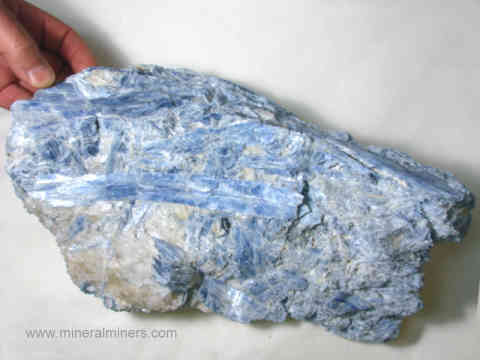 We have naturally terminated mineral specimens available in a very large variety of minerals including large pegmatite matrix mineral specimens. 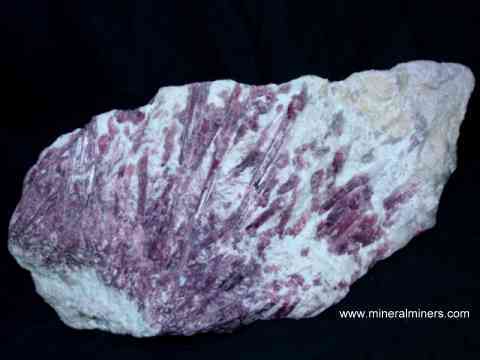 See our page with links to natural crystals of all mineral varieties! See also our page with links to all of our polished crystals. 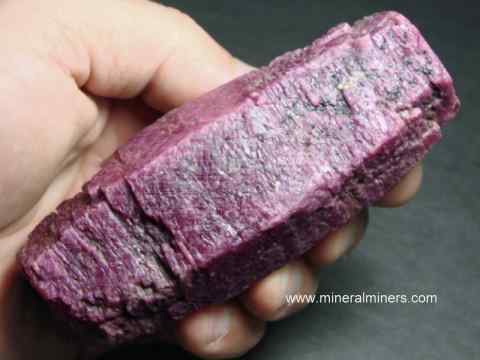 We specialize in natural mineral specimens. 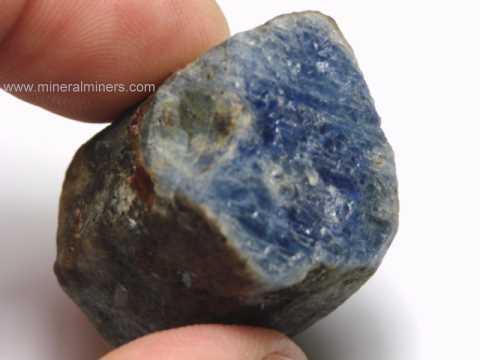 See the links below for a selection of superior quality natural mineral specimens. Each one of our black tourmaline crystal specimens is completely natural with natural terminations, and they were mined in Brazil. You may have noticed that we have naturally terminated black tourmaline specimens in all sizes from one inch long ranging up to more than 20 pounds each! These are all natural black tourmaline crystal specimens. Here at mineralminers.com, we do not have any heated or treated black tourmalines, each black tourmaline specimen is 100% natural! 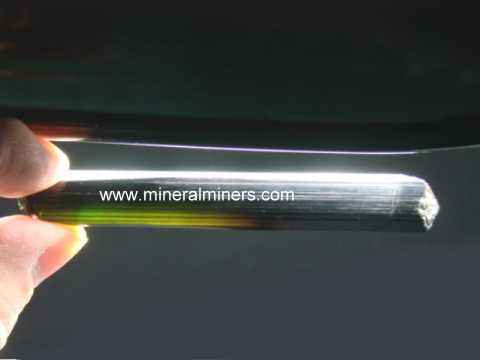 We specialize in superior quality natural black tourmaline crystal specimens and matrix specimens of large size. We do have more black tourmalines in stock, including some very rare quality large black tourmaline crystals in matrix and some extra large pegmatite matrix specimens that have hundreds of black tourmaline crystals! For more information about natural black tourmaline and its history, physical properties, chemistry, occurance, and metaphysical uses be sure to see our tourmaline information page. 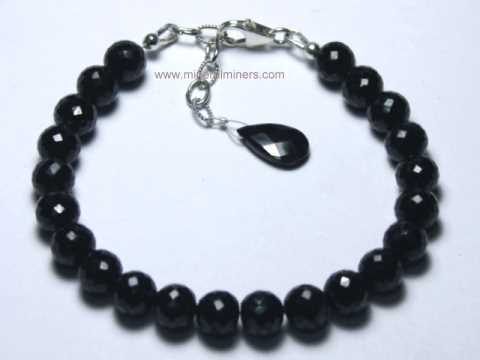 See also our page displaying genuine black tourmaline jewelry. To see more black tourmaline photos, just select another linked image displayed below. 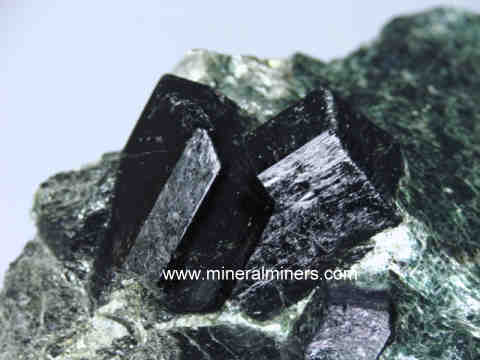 Would you like us to inform you when we add more naturally terminated black tourmaline crystals and black tourmaline in matrix mineral specimens on this page? We do have more natural black tourmaline crystals and matrix mineral specimens in stock, so be sure to let us know if you have any black tourmaline crystal special requests. 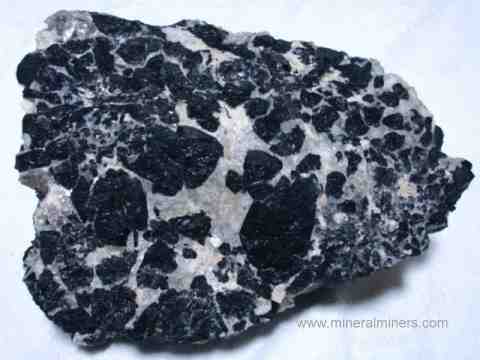 Please contact our webmaster about black tourmaline crystals or our 'site' geologist with any questions or comments.